Seeing a mass exodus and coinciding ruckus from Bluesfest's Barney Danson Theatre it became apparent that something cool was happening, scaring the lawn chair crowd back to their spots for Steely Dan. 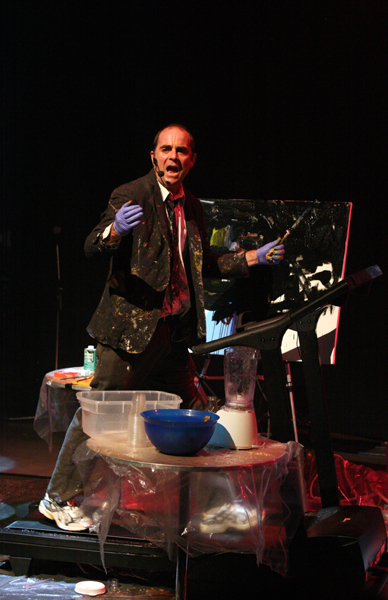 Los Angeles Public Access TV host, Youtube cult figure and performance artist John Kilduff was painting the audience, while running on a treadmill, while blending mixed drinks, while fielding a Q&A session from the audience. He performs again tomorrow (July 6 at 6:15pm in the theatre). Check out a video of one of his TV show here. Seeing John on the treadmill almost made up for missing the gym today.